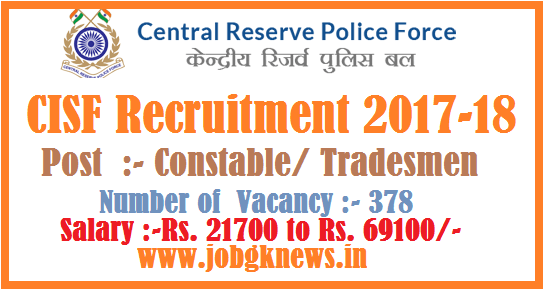 Central Industrial Security Force (CISF) has released a notification for the recruitment of 487 Constables/Fire (CISF Form). Interested candidates may check the vacancy details and apply online from 11-12-2017 to 11-01-2018. More details about "CISF Recruitment 2018", including number of vacancies, eligibility criteria, selection procedure, how to apply and important dates, are given below..
Educational Qualification: Candidates should have passed 10+2 with science or equivalent from a recognised board. (as on 11-01-2018)Minimum 18 years and Maximum 23 years. Selection of candidates will be made on the basis of Physical Efficiency Test, Physical Standard Test, Written Examination and Medical Examination. General/UR/OBC candidates have to pay Rs. 100 through SBI Bank Challan OR online mode using Net-banking/Credit or Debit Card. SC/ST/Ex-Servicemen don’t have to pay any fee. Interested and eligible candidates may apply online through CISF website - http://www.davp.nic.in/ - from 11-12-2017 to 11-01-2018.